See our FAQs, then email us. She’s the First is a small and mighty team. Due to the volume of emails we receive, we are unable to respond to each message personally. We’ve created an FAQ guide below to help you. Please review this list before contacting us. If your question is answered below, you may not receive a direct response. Thank you! Thanks for your note! We'll review as soon as we can. Due to the volume of inquiries we receive, we are unable to personally address questions that are answered in our FAQ. Please double check them below. Below you'll find the most commonly asked questions about our programs, ways your business can support, and how you can volunteer. Is She's the First a registered 501(C)(3)? Yes. STF is a 501(c)(3) certified organization with EIN 65-1321437. If my employer will match my donation, can that be applied to the STF Girls’ Group I support? High five for doubling your impact! We deposit your employer's match of your scholarship donations to our scholarship fund. Given the volume of employer matching gifts we receive, as of April 2018, we are no longer able to restrict these funds to a specific girls’ group. We can guarantee 100% of it will go toward She’s the First scholarships. What if I raised $300+ on a fundraiser via Facebook? Great work using that social media prowess for girls' education! If you raise $300+ or more for She's the First via Facebook, shoot us an email at [email protected] with your name, contact info, the amount you raised, and your Facebook fundraiser link, and we'll match you with a group of STF Scholars. When will I find out about the STF Girls’ Group I am matched with? If you’ve donated over $300 to be matched with an STF Girls’ Group (a group of STF Scholars), you will receive an email from us within 8-12 weeks from your gift date. This time is used to determine who your funding will support, based on your requested country and the current scholarship needs of students in our partner programs. Additional information, such as frequency of communication and what to expect when you are matched, will be included in this initial correspondence. How can I donate to She's the First if I live outside of the United States? You can donate here. The website can only support amounts converted into U.S. dollars. Please use a currency converter tool at the time of your donation to ensure that you are donating the correct amount. How can I get a scholarship from She’s the First? We grant scholarships solely through our partner organizations. See above. How are STF Scholars selected? Our local partner programs select the students who receive She’s the First scholarships at their schools, based on scholastic merit and financial need. How does STF choose partner programs? Through a rigorous process! When we are looking to expand, we put out a call for partner applications in countries of interest. She’s the First will have a preliminary conversation with a potential NGO partner, and if our values and shared needs align, an extensive written application will be completed, followed by a series of interviews over Skype or phone. Potential partners also submit financials as well as references, and our team will often do a site visit before officially adding them to the network. 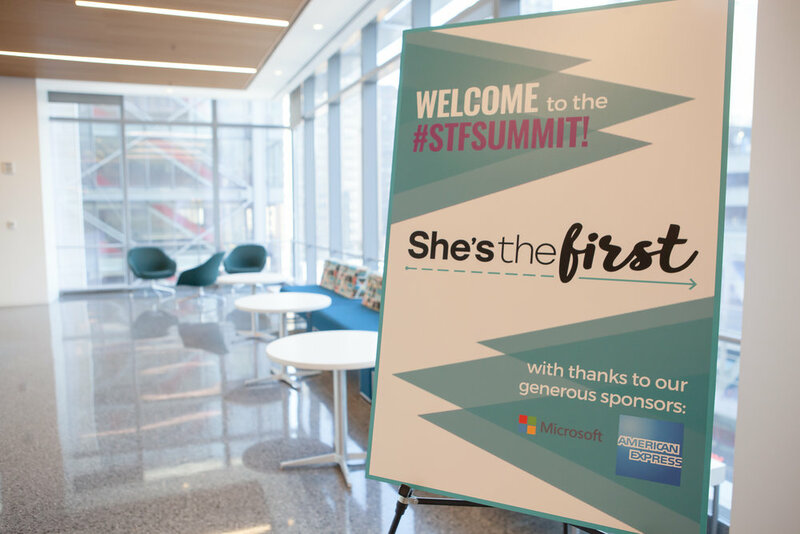 All of our partner programs share our philosophy for comprehensive, quality education and embrace the programming and support that the She’s the First network and scholarships provide. How can I apply to be part of the STF network of partners? Our most recent interest form is here, and we review it twice per year. Does She’s the First partner with companies? Yes, we have contracted partnerships with companies aligned with our mission and values, who make a significant, multi-year financial contribution to our programs and general operations. We support these partnerships with high visibility and engagement. How can I support She’s the First without a contracted partnership? There are many companies that support She’s the First independently, such as donating proceeds from a product/service or employee fundraisers, often maximized through matching gift policies. We welcome you to use the tools and brand guidelines on our website to further your advocacy efforts. Donate as you would normally, through our website or by check, and you will be eligible for the same donor benefits shown here. For more information about our corporate giving, visit here. How can I work for She’s the First? We will list any open positions on our Careers page here. How can I intern for She’s the First? If you are eligible to receive college credit for your internship, take a look here. We offer our interns a modest stipend along with professional development opportunities. How can I volunteer with She’s the First? No matter where you are, you can take action by raising funds or awareness. Here are ideas to get you started, but feel free to create your own opportunity based on your personal interests and activities! How can I start a Campus Chapter? Make sure you meet the requirements outlined here and then follow the instructions to apply during the application cycle. How can I travel to She’s the First partner programs? She’s the First does not facilitate travel opportunities for the general public.